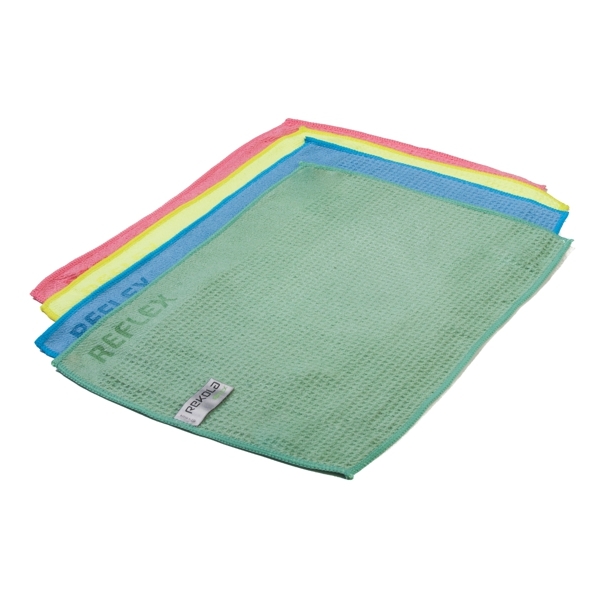 Our capable and versatile hand cloths are made with 100% Ultra-Microfiber and unique pocket structure. Suitable for hard top surfaces including glass, chrome and mirrors, the pocket structure allows for larger particles of dirt and dust to be removed more efficiently. Even bacteria will be removed – tests prove that this cloth removed more than 99,9%* (* Weber & Leucht GmbH) of bacteria from contaminated surfaces. This cloths Ultra-Microfiber is seven times finer than basic microfiber and the finer the fiber, the smaller the particle will be removed from the surface. All smooth and sealed hard top surfaces for best hygienic cleaning results. suitable for use in healthcare, nurseries, schools, universities, offices, public buildings, food industry, hospitality, residential, pharmaceutical and cleanroom areas etc. Depending surface circumstances charge the cloths with 50-100 ml per cloth. - low water level during processing or overloading washing machine (max a. 80% of door window) may cause irreversible damage to cloths. 500 washing cycles. Rough surfaces like safety flooring will reduce lifetime expectations. 500 times use and wash in general hygiene cleaning circumstances.